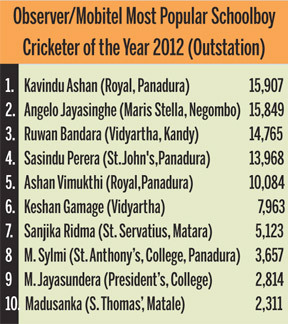 MOST POPULAR SCHOOLBOY CRICKETER OF THE YEAR 2012 CONTEST: Royal College, Panadura’s Kavindu Ashan sprang into the top spot of the Outstation category while Thurstan’s Ashan Wanigaratne continued his dominance at the top spot of the All-Island Contest at the end of count number 9 in the Sunday Observer/Mobitel Most Popular Schoolboy Cricketer of the Year Contest 2012. In the Outstation contest, Kavindu Ashan (Royal, Panadura) climbed to the top position after being placed at number 4 last week polling 15,907 votes, 58 votes more than Maris Stella’s Angelo Jayasinghe who polled in 15,849 pushing him to the second place. 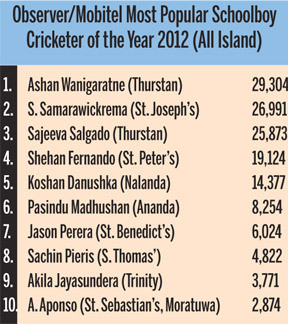 In the All Island Contest, Thurstan’s Sajeeva Salgado who was placed second to his schoolmate Ashan Wanigaratne last week went one position down to number three as Josephian Sadeera Samarawickrema moved up to number two.